To find it faster, click on Movies category on the left hand side. Get an extra $10 free when cash in $40 worth at the Coinstar Machine. No fees if redeem for a gift certificate to stores like Amazon.com, iTunes or Lowe's, instead of cash. Children's Place 20% off entire purchase! Just use code: Earlybird9 and checkout. They have some cute baby boy shirts and pants that end up being $3-$8. Shipping is only $5! Blackfriday.info just posted the Black Friday ads for Michael's and Joanns. Mae Boutique is giving away a $100 gift certificate to Bounce U in Gilbert, all you have to do is show up at one of their boutiques in the next two weeks. Event dates are this Friday & Saturday (November 27th & 28th) and next Friday and Saturday, (December 4th & 5th) So, if you are already out on Black Friday, make your way to Queen Creek (Copper Basin) and win yourself a door prize! They have around 20 vendors that will be there, so there will be A LOT of awesome things to choose from. Besides, Mae Boutique is awesome. Trust me. The ad is like 32 pages long, so I am not posting all of the deals, but go to http://www.walmart.com/ and check them out! Chadwicks $15 off of $15 Purchase. You can't beat this. But hurry, today is the last day! Receive $15 off any $15 or more purchase from Chadwick's. Use code CH15OFF through TODAY! I heart Amazon. Every day this week, Amazon is offering Black Friday deals. Not only are there the usual discounts, there are new markdowns and awesome special offers for every department. The deals will be changing and updating quite often, so keep checking back for even more savings for your $! Order $25 or more and you get free shipping! I promise to get caught up on deal posting for the rest of this year and stop ignoring you. The Target in Queen Creek is offering a free pair of glasses to children 12 and under who already have a prescription. They have a few choices to pick from and they are totally free! I ordered my daughters yesterday it would have been $169.99 I paid 0!! It is some promotion thing that is going on but she said only until the 17th of November! Just bring in your prescription, and your child for the fitting and that is it! Thanks to Freebies4Mom, now you can get 50 5x7 or 4x8 photo cards (w/envelopes!) for FREE! Just use the code freebies4mom-1109 at checkout and you'll see the instant savings in your cart. Snapfish: Today only 100 FREE PRINTS! ONE DAY DEAL @ Snapfish . Get 100 FREE prints with any $5 or more purchase. Plus: New users get another 50 free prints for signing up!! To get this deal, use code Free5. Offer ends tonight at midnight. It's beginning to look a lot like Christmas! Time to cash in on some cheap and easy gifts for family! JCPenney: $10 off $10 or more online! To get $10 off your next purchase of $10 or more at JCPenney, enter code GR8VALUE. To get free shipping on orders of $49 or more thru Dec 18, enter code VF49FREE for free shipping! Fry's is currently accepting competitor coupons. This includes the Fresh & Easy $10/$50 coupon that you can print online! Halloween costumes are 75% off at Wal Mart! Rittenhouse/Ocotillo WM had tons this morning. Price: $30.00 for one weekend or $50.00 for both weekends. You are not required to stay and sell your items, we do all that for you! 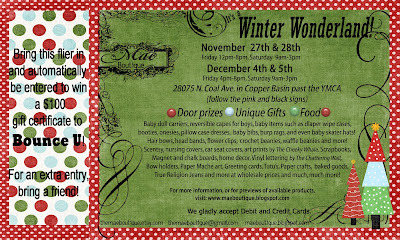 Please email themaeboutique@gmail.com if you are interested in being a vendor. 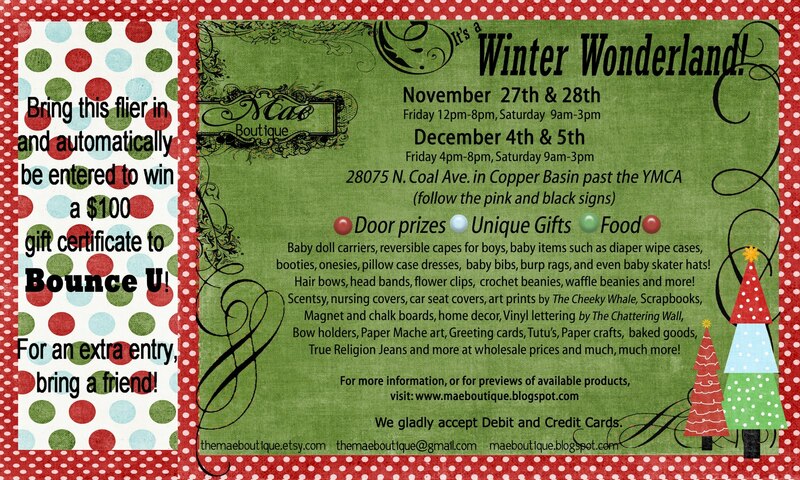 MaeBoutique will not double book vendors so hurry if you want a spot! Albertsons: Quadrupling coupons up to $1 this week. I am planning on going tonight, so I will have to let you all know how I do. Arts Cow is offering 1200 free prints to new registrants 600 4x6 and 600 5x7 . Plis, if you place an order totalling more than $30, you'll get free shipping with code FREESHIPPING30 thru 11/11/09! I'm officially out of excuses not to scrapbook this month.